PLEASE JOIN US FOR AN EVENING OF HONORING ALL PLAYERS AND COACHES! RESERVATIONS AND PAYMENTS MUST BE RECEIVED BY 11/12/2018. PLEASE DO NOT GIVE ANY RESERVATION SLIPS, MONEY, OR CHECKS TO THE FOOTBALL COACHES. NO TICKETS WILL BE SOLD AT THE DOOR. NO ADDITIONAL GUESTS ON THE DATE OF THE BANQUET. QUESTIONS? Please contact: Julie Tafelski (734) 751-8588 or Tina Frazier (734) 334-3526. 5:55 Players come to get their pictures taken, return to warmup as soon as they are finished. Volunteers needed for this Homecoming/Senior Night! Please contact Melissa Mulvaney directly at < > to help! · This Wednesday (TOMORROW!) is the last opportunity to get your Senior pictures taken for playoff posters and senior slideshow. Please arrive to Jon Vespaziani's house right after the spaghetti dinner. Wear any color uniform you want (need pants, shirt, and shoulder pads). It only takes a few minutes to take the pictures! The address is 1210 Hendrie, Canton. ​Thursday, August 9: Tomorrow is our 2nd money collection day...we are only 643 away from our goal. Two players have each sold 60...we need everyone to do their part and sell their 20 cards. Money should be turned in with their name and amount written on the front of the envelope. Checks can be made out to CCFBC if that is easier. If you need more cards, please text or call Mrs. Troszak (734)751-2823. ​Friday, August 10: FULL PADS Spirit Ads are due today if you wish to purchase one for your player. 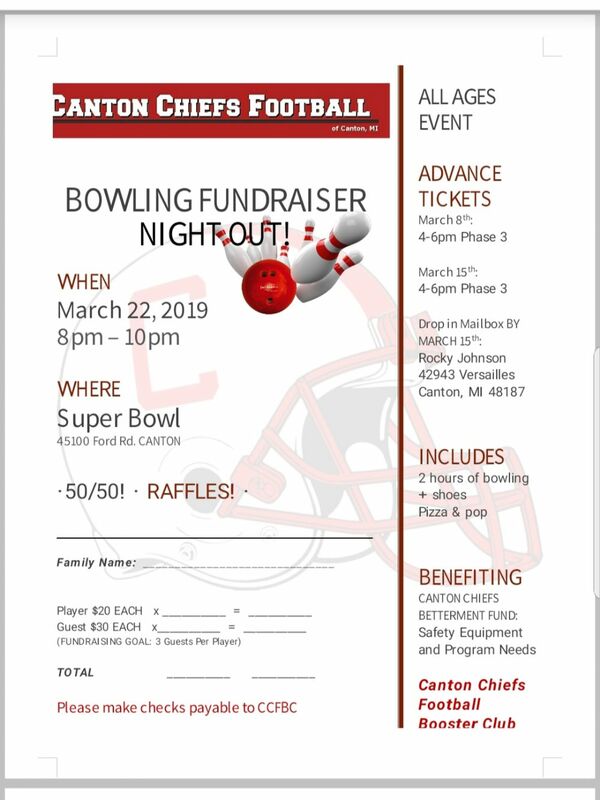 Please turn your order form and money into Dave Larson (734)502-2524/6699 Wethersfield Way Canton. The boys love seeing the messages in the Program book! Saturday, August 11: ALL money and left over cards are turned back in to coaches. Check-In will start at 7:00 am. This is a time consuming process and it takes time to verify that every player's cards and/or money is accounted for. Players will not be allowed on the field until they are cleared regarding Adrenaline Cards. They will be sent home to get ones that are forgotten. If you signed up to bring water/Gatorade and ice for the pizza party, please keep your receipts and give them to Joelle Troszak by 8:00 on Saturdaymorning. Please put it in an envelope with your name and your players name and squad so that she can get you reimbursed. 12-3 Blitz: Those players that did not sell their 20 Adrenaline cards will be selling at local businesses or in local neighborhoods. Parents of those players are expected to provide transportation to the assigned location. ​Sunday, August 11: No Practice...It has been decided that the players need a day to rest. ​Tuesday, August 13: Practice for all squads will be from 3:30-8:30. Wednesday, August 14: It is picture day! Pictures take place at the Varsity Field. Please remind your player to wear their complete uniform: helmet, pants, jersey, socks, and belt. Every player needs to have money or check if ordering pictures. Freshman...arrive at Phase 3 by 10:00 am. Everyone rides the bus there and back. Players wear full pads. Carry your helmet and shoulder pads. The scrimmage is at noon. JV....arrive at Phase 3 by 2:00. The scrimmage is at 4:00. Varsity ...arrive at Phase 3 by 4:00. The scrimmage is at 6:30. Friday, August 16: Practice will be from Noon-2:00 for Varsity and JV. Practice will be from 3:30-6:30 for Freshman. ​Saturday, August 17: Practice is from 9-Noon..this practice is totally dependent on the number of Adrenaline cards sold and if the entire program meets the goal set by Coach! As alway, please contact me if you have any questions. Tuesday and Thursday are ADRENALINE CHECKS! Please be ready 30 minutes prior to your practice time with your money in an envelope marked with your name, squad and amount. Tuesday's goal is to have at least 15 cards sold. Please keep selling so we can meet our team goal of 2,000 cards sold. This is a TEAM effort and can not be met by a few individuals! Joelle Troszak will be at the practice field after tomorrow's practice if anyone needs more cards. Mark your calendars for NEXT SUNDAY, August 12th for a possible practice, approx 90 minutes. Details will be communicated as soon as they are available. Pay To Play reminder: Deadline Monday, Aug. 20th. SPIRIT ADS for the football program are due THIS FRIDAY Aug. 1oth to Dave Larson. Please contact Dave directly at 734-502-2524. PLEASE NOTE! The online schedule above always supersedes any prior schedules - please check it frequently! Same week schedule changes will always be communicated via email also. Last call for golfers!!!! Anyone?? Thank you also to all of the boys who have volunteered to help carry bags & to the parents who have volunteered to help me at the outing. I will be sending a separate email tomorrow to these boys/parents. Please click ''Sign Up Genius" tab above. Enter email address ( ) when prompted for the Sign Up List's creator. 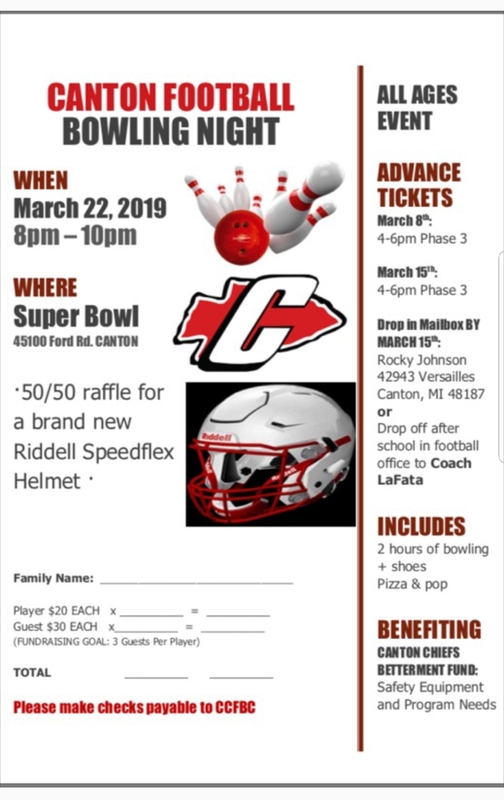 Please contact Dianne directly (734)788-8343) with any questions. We would still like to have a few more golfers, so if you haven’t turned in your foursome yet, please get it to me. We are getting down to crunch time :) And remember, if you don’t golf, you can still come to the dinner ($35 per person). Player Volunteer Opportunity: We would love to have some of the football players help carry golf bags to the carts as our golfers arrive on Aug. 4th. If your player is interested, please email me & I will send a separate email with more details. I would want them to arrive by 11:15 & they would be finished by about 1:15pm. Parent Volunteer Opportunity: I need one or maybe 2 parents who would be willing to sit at the grand prize Hole in One hole to serve as a witness in case anyone hits a hole in one. One person from 1:25-3:30 and another person from 3:25-5:30ish. Please email me if you would be willing to do this. Parent Volunteer Opportunity: I would love to have someone who is willing to come & take pictures of our foursomes. These pictures will go in our football program. Any photographers out there? Thank you so much for all of the support! Couldn’t make this happen without all of you!! Golf Outing - August 4th! The 16th Annual Canton Chiefs Golf Tournament is August 4th. We need golfers!! We would like to have at least 100 golfers for a shot gun start. 2. Sponsor: If you are not a golfer, we still need your help!! Do you own a business or know someone who does? Sponsoring a cart or hole is a great way to advertise your business and help out your Canton Chiefs football team. Your family can also sponsor a cart or hole. 3. Donate: Ask the businesses who take YOUR money; hair salons, nail salons, lawn maintenance companies, insurance companies, financial advisors, restaurants, etc. These donations are tax-deductible. (The letter with our tax-ID is attached). The golf registration form and sponsorship form can be found under the 'Documents' tab on the left. REMINDER: Don't forget to update your player's PRIVOT account or create one if you have not already done so. Please remember that the physical needs to be downloaded to your account. (Physicals must be dated after April 15, 2018 in order to play.) The directions for PRIVOT are in the red folder that every player received at Meet the Coaches night. Tuesday/Thursday: Players are at Phase 3 for the entire time. Finally, the Passing League (Varsity players only) will resume on Monday, July 9 at 6 pm at Franklin. Skills Camp: Last week, Coach Mui and several other coaches worked with the incoming 9th graders at the annual Freshman camp. We would like to welcome all the new families and players. Don't forget that there is another opportunity to get to know your teammates the week of July 23rd during the 2nd Skills Camp Week. If you did not receive your shirt & shorts at the first camp, they will be there for the second one. Full House T/ 3-4 Camp: This camp is for JV and Varsity players and begins June 17th 2:00-5:00 pm. It is supposed to be super hot, so start hydrating today! Water, Water, Water Camp will be from 5:00-8:00 on Tuesday, Wednesday, and Thursday. Passing League: This is for some Varsity players and the players will know if they are to attend. This event has been changing for the past few weeks but as of yesterday, here are the details. Monday (6/18) will be held at Livonia Franklin High School from 6:00-7:45 pm. The boys will meet at Phase 3 at 5:00 to carpool. Workouts/Speed Training: This is for all players! This starts on Monday, June 25th and is held from Monday-Thursday from 10:00-11:30/noon. Monday/Wednesday are in the Weight Room and Tuesday/Thursday are Speed Training in the Gym. If your player has an issue with transportation, please let Coach LaFata know. We may be able to suggest a player that lives in your area that could provide help. Fan Cloth Fundraiser: Supposedly, it is all arriving on Tuesday at Dianne Suppelsa's house. As soon as it arrives, she would like it out of her garage, so please plan on picking your order up on Wednesday. We will send out an email as soon as it arrives with details as to the pick up times. Golf Outing: Mark your calendars for August 4th! Heather Vickers is the chairperson for this event (hmvickers@gmail.com). It is a huge undertaking and it would be helpful if you could get your forms in. She is looking for golfers!!! Please don't wait and make her worry if we have enough people or sponsors. If you are golfing, sponsoring a hole, sending in donations, etc...we urge you to do it now! We hope every family will participate in some manner. This is a fun day to spend together as the Canton Chief Football Family. Let's make this year's golf event a success!! Club Emails: If you are not receiving club emails and have previously submitted your contact info, please double check your spam folder and/or add Notification@leagueathletics.com to your contacts. If you would like to add a new email, please send it to gibbons.hanoe@gmail.com.